"This is in my top five favorite meals of all time. This is the meal I would serve if a French chef was coming to dinner. A very flavorful main dish that your taste buds will be amazed at!" To Make Crepes: In a medium bowl combine the flour, milk, eggs, oil and salt and beat together for 1 minute, until you have a smooth, thin batter. Heat a lightly greased medium skillet over medium heat, pouring in a thin layer of crepe batter that covers bottom of pan. Brown on one side only, repeating until all of the batter is used. Set crepes aside. To Make Filling: Melt butter in a large skillet over medium heat and saute celery and onion until just barely tender. Stir in flour, salt and curry, blending well. Dissolve bouillon in water, then pour milk and bouillon mixture into skillet, stirring until well mixed and thickened. 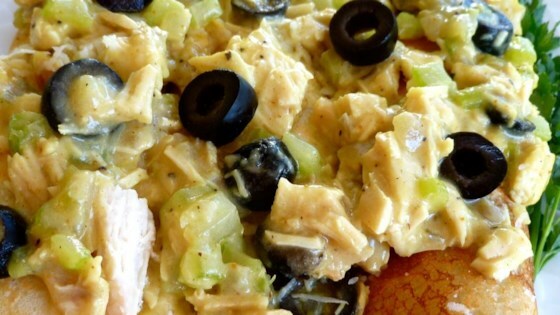 Add olives and chicken and mix all together. Spoon some of the filling mixture onto the center of each crepe, leaving enough room to fold edges burrito-style. Fold up crepes and place in a lightly greased 9x13 inch baking dish. Sprinkle with cheese. Bake in preheated oven for about 12 minutes, or until cheese is melted. If you DO NOT like spice-then this ones for you! I think it's very bland and needs some kick! Otherwise, the flavors are pleasant and ingredients are well-suited together. Skipped the olives and used mushrooms and boneless, skinless chicken thighs. I also placed steamed asparagus inside each crepe. Very good. This is a wonderful, simple dish. I have a family with 6 kids ranging from 18-5 and it was a hit with all...That is a great dish in my book! Delicious and great presentation. Used canned chicken, added fresh minced garlic and heavy whipping cream instead of milk. Omitted the salt. I added 1/2 can of cream of mushroom soup to the crepe filling to make it creamier. My husband and I both enjoyed this recipe.